In the distant future of Warframe, you are a space ninja who has woken from a long slumber to find the solar system in disarray. Armed with a variety of exciting powers, you must fight an army of decaying clones, tech-minded science jerks, mutant freaks and other awesome enemies. The entire game is free to play, but it’s so good that I spent a hundred bucks on it and don’t regret a cent. For me, it’s a point of pride that I don’t spend money on free to play games. Spending money means giving in to systems designed to manipulate me; it feels like losing. That constant reminder on players to buy, buy, buy is like a movie theatre interrupting a movie every few seconds to remind people that they can buy popcorn and soda any time they’d like. Not giving in to the ads feels like winning against an intrusive and unpleasant experience. Digital Extremes’ Warframe is different–different enough that I actually bought Prime Access and some platinum. In all, I’ve spent about $100 on the game, something I’ve never done for a free to play game before. I felt like Warframe was worth it. You don’t have to pay, though, and the game does not constantly dangle the option to pay in your face. The only reminders that you should spend money are located deep within customization menus or in the store, which is a console in your ship that you can easily ignore. Warframe doesn’t care about balance. You’re a badass space ninja, after all! ... What’s great about being overpowered is that, since everyone is overpowered, no one is. The multiplatform free-to-play game is an action shooter with some of the trappings of an MMO. It launched in 2013 and is available now on PC, PS4 and Xbox One, where it is regularly updated. As a recently-awoken space ninja called a Tenno, your job is to fly around the solar system doing space ninja stuff like assassinations, spying on people, stealing information, and performing sabotage. Each mission location and type remains the same, but the missions themselves are somewhat randomized. The game relies on a random tile system to keep things fresh. Your base of operations–and your main menu–is your ship. When you log in, you’re sitting in front of your command console, which lets you select where you want to go in the solar system. To your right is the store. To your left is the codex. Behind you, deeper in the ship, are other stations, like the foundry that lets you build weapons or the armory that allows you to outfit and modify your frames. Ah, right, frames. The eponymous warframes operate like character classes, except instead of being locked into one class per character, you can swap frames at will, with each frame having four unique powers. For one mission, you might feel like running the supportive frame Trinity, who can mass heal the entire team or provide energy vampire abilities to ensure quick regeneration. On the next mission, you might want to play as Ember, whose incredible World on Fire ability burns every enemy within a massive radius. You obtain warframes by defeating bosses and getting their parts or by completing some of the game’s great quests. Warframes are not just some cool gimmick or branding idea, but a cool design choice. Two good ideas make them great: first, they’re all overpowered, and second, you have to hunt them down. Warframe doesn’t care about balance. You’re a badass space ninja, after all! Rather than pushing players through a lengthy and meaningless grind, Warframe provides players tons of awesome and incredibly destructive powers. I love running Frost, a frame that launches a massive blast of ice, freezing everything around it, killing most low-level enemies. Playing like Frost feels like running around as a tactical nuke. The sheer destructive power being wielded is awe-inspiring, but that’s true of every frame. Valkyr’s power is invulnerability. It comes at the expense of ranged weapons, but that’s fine, because as a space ninja, your swords are just as cool, if not cooler, than your guns. What’s great about being overpowered is that, since everyone is overpowered, no one is. The power you wield makes you feel like you’re actually a badass space ninja, because you’re killing lots of enemies quickly and efficiently. Other sci-fi games, like Mass Effect 2, force you into cover through a lack of health and a focus on small groups of enemies. There’s no sense of lethality or badassery going on when your character feels like they’re made of soggy toilet paper while enemies can last through an entire magazine of gunfire. Warframe understands this, so every frame feels fun to play, because every frame has powerful, over-the-top capabilities. A friend of mine recently picked up one of the harder-to-obtain warframes, Ivara. He didn’t like her at first, until he realized that, among other things, he could use her abilities to create ziplines anywhere on the map. Ivara drastically altered his mobility and our fireteam’s damage capabilities, allowing us to breeze through content that had previously been too challenging. I’ve played a lot of games over the years, and it seems like most developers’ idea of balance is that everything should feel equally underpowered. The player generally has to play with caution, staying back, even occasionally bunching up, letting enemies come to them as they cheese their way through fights. Warframe’s “you should feel like a ninja” approach encourages more proactive players who slice, dice, and explode their way through hundreds of enemies. I’ve seen builds that kill every enemy on the field at a given time. I’ve watched players one-hit kill a boss and continue onwards as if nothing happened. Warframe’s lethality doesn’t just make you feel effective. It gets you through content quickly, too. Most online games require massive amounts of player time but lack sufficient content to actually demand that time. They rely on heavy amounts of repetition and luck. Players have to play a lot to get a little. Warframe instead allows you to pass through content quickly and always guarantees something interesting at the end of the journey. As a ninja, you can “bullet jump” through most of the maps. Bullet jumping is a way to bypass lots of enemies by zipping past most enemies faster than they can respond. This means that you can get through missions quickly. That works well with another of the game’s better-implemented elements: timed content. Every few minutes, a new challenge pops up. Sometimes, the reward is credits. Other times, it’s crafting materials. I follow a Twitter feed that alerts me any time a blueprint is available. Combined with the speed at which I can complete content, I can catch a Twitter alert, pop into the game, grab the loot I want, and get back to whatever I was doing without a problem. I recently got an alert for an item I wanted, logged in, played through the mission, and obtained the item within about 10 minutes. The result is a game that can be played in brief 10 to 15 minute spurts, as opposed to a game like The Division, which has a tiny handful of missions that require daily grinding if you want to be able to get enough credits to buy good gear. Warframe’s speed means that it doesn’t doesn’t demand your commitment, but if you’re looking for something more in your relationship, the game’s got you covered. A traditional loot game sends you into an encounter with the expectation of randomized loot. Take Borderlands, for instance. The game claims to have about 87 bazillion guns, but how many of those are meaningful or interesting guns? Most of the guns I’ve encountered in the Borderlands series are samey, even unremarkable, with the exception of a few gag guns. The same is true of The Division; I can’t tell you how many Vectors I’ve located, but I can tell you that they all play the same, just doing more or less damage depending on their stats. There’s rarely a shout of disappointment when members of my clan face a boss in Warframe. Because bosses always drop good loot, it feels like you’re always progressing. Warframe isn’t like that. Rather than having leveled loot with the traditional white/green/blue/purple/orange color scheme, Warframe has a distinct selection of unique gear. The Atlas frame plays differently than Mesa who is completely unlike Zephyr, who is nothing at all like Ash. The guns are distinct, too. A player running a grenade launcher like the Tonkor is going to be playing very differently than a sniper using Amprex Vulkar. I’m hoping to obtain a Sancti Tigris soon. Because all the loot is specific, play feels a lot more organized. Rather than simply flinging one’s self at a boss in the hopes of getting good loot, Warframe players plan a specific route to good gear. If I want to obtain the Equinox frame, for instance, I need to face Tyl Regor, the final boss on Uranus. Fight him enough and he’ll drop all the gear I need. Bosses will always drop an important component or blueprint. The majority of frames only need three parts: the systems, chassis, and helmet. To get those parts, players need blueprints. Face a boss down five or six times, and you’ll probably get all of them. Make sure you have the crafting materials you need, stick the parts in the foundry, and you’re all good to go. In a few days, you’ll have an entirely new way to play the game. Because bosses always drop good loot, it feels like you’re always progressing. There’s rarely ao shout of disappointment when members of my clan face a boss in Warframe. Even when the boss drops a part we already have, we can sell it for resources. There’s never a situation where you’re fuming because you’ve just spent an hour on a mission and the boss only dropped loot that was below your level. Warframe bosses always drop something useful. You almost always have something to do. Want to craft this frame? Cool, hunt down that boss. Oh, need some certain materials to build those parts? Let’s go to this location and get some materials. But wait! There’s an alert for something you need. Better do that really quick. There’s always something to do if you want, always something to find and benefit from. There’s no such thing as getting a gun that’s below your level, because all guns—and all frames—are created equal. Everything is overpowered, and everything is easily obtained. Warframe never wastes your time with extremely long missions with bad drops. There is no room for disappointment. It’s a game about momentum. That’s Warframe in a nutshell. It’s a game that lets you feel like a badass by giving you tremendous amounts of control over the way you play. Want to spend 10 minutes with the game? Have at it. Want to use a completely different class? Why not! Most games let you create one character—a Hunter or a Soldier or a Witch Doctor or what have you, and you’re locked into that. If you want more characters, you have to replay the entire story and level up a new character from scratch. Warframe is better: it provides you with the ability to unlock up to 29 different classes with four abilities each and switch between them at will. Plus it has an extensive modding system that allows you to radically customize your characters and weapon loadouts. The most recent major addition to the game is Update 18.5, which adds a new major quest line, a new tileset, and a new warframe, Inaros. The big updates seem to arrive every few months—the PC version of the game gets hotfixes and updates almost every day. The last major quest update, The Second Dream, Update 18.0, launched December 3, 2015. Digital Extremes does an excellent job of updates. Heck, they will warn you in-game that they’re pushing an update, unlike many games I’ve played, that randomly force players out without a word. Digital Extremes isn’t afraid of massive changes, either. Back when I first started the game, there was no spaceship and everything was done in menus. Now we’ve got more planets, several massive quests, the ship, and some other very good new features that I’d rather not spoil. It’s a counterintuitive game: rather than increasing the length of its grind, Warframe has shortened it to digestible amounts. Rather than constantly reminding me it has items available for sale, Warframe has quietly nudged me whenever it has one of its frequent updates. 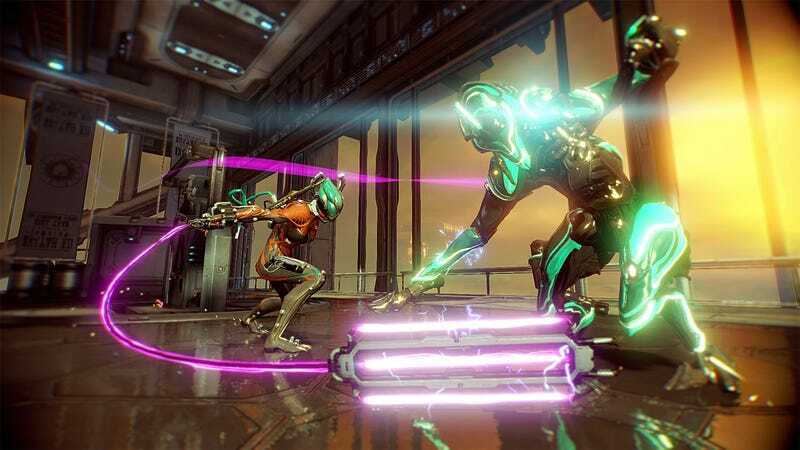 Instead of providing small, single-digit percent chance upgrades, for a character with a single powerful ability, Warframe has created a massive variety of extremely different playstyles and emphasized constantly switching those up. I wish more games were like Warframe. I like being able to jump in for a few minutes and feel like I progressed just as much as I like to log on for a few hours and feel like I did a lot of different things. I love being able to pick specific loot and make concrete progress towards that. I love how all my abilities seem different and interesting. I use a combination of my abilities, mods, weapons, and my friends abilities to have a good time. Warframe has its problems, sure. I felt more like a ninja in Metal Gear Rising. The enemies were more fun to fight in Gears of War. The guns are a lot more satisfying in Halo. As persistent online games go, however I think it’s the best one out there right now. It’s free, and it’s available on just about every major gaming platform out there. Definitely give it a try.